While most of the people who have something to share to the victims of the Flooding In Metro Manila are busy helping in the relief operations, I made my “very private and personal” experience to share the collections of slightly used running shoes and finishers’ shirts sent through Balikbayan Boxes from my ultrarunning friend, Benjamin Gaetos of Los Angeles, California to the Officers and Men of the Special Forces Regiment of the Philippine Army who are based in Fort Magsaysay, Palayan City. These soldiers had been helping me in the conduct of the First 100-Mile Ultra Trail Run in the country dubbed as the “Taklang Damulag 100-Mile Trail Run” and the “Taklang Damulag 50-Mile/50K Trail Runs & Half-Marathon Races”. 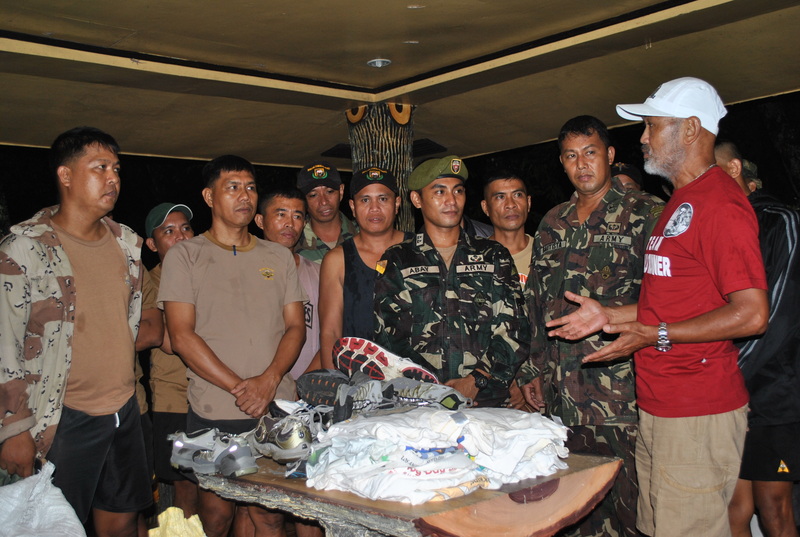 More than 50 pairs of running shoes and more than the same number of Finisher’s Shirts were received by First Lieutenant Tony Abay, Commander of the Soecial Forces Regiment School and his men in a simple ceremony. It was a very simple event but it was memorable to everybody. Thanks to Benjamin Gaetos for his untiring efforts to pack and send these shoes through Balikbayan Boxes from Los Angeles, California! My snappy salute to you and to the rest of your ultrarunning friends out there in California, USA!